DYMO Web Service needs to be up and running on your system to use WooCommerce DYMO Print. The DYMO Web Service controls all communication between WooCommerce DYMO Print and your DYMO LabelWriter. On this page you’ll find all information you need if you’re experiencing problems during printing. In the past, developers had to provide a browser-specific plug-in for each major web browser. Nowadays, most browsers have phased out native plug-in support. Google, for example, stopped supporting Chrome their NPAPI browser extension in September 2015. In response, DYMO released the DYMO Web Service as a new cross-browser solution allowing third-party developer applications the ability to interface with the DLS SDK in a seamless, browser-agnostic fashion. To install DYMO Web Service you need to download and install the latest version of DYMO Label Software. How can I tell if DYMO Web Service is installed? 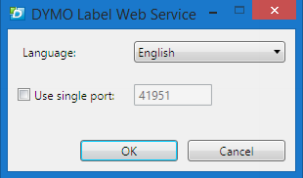 The DYMO Web Service should be installed as long as you have installed DYMO Label Software 8.7.2 or newer using the setup type “Complete” mode. How can I tell if the DYMO Web Service is running? WooCommerce DYMO Print will not work if you stop the DYMO Web Service. You can start or stop the web service at any time by clicking on the Start service and Stop service menu items, respectively. Although the service icon will remain in the system tray after stopping it, no API functions will be executed. If you’re experiencing errors during printing check if the DYMO Web Service is working correctly. Advanced use only! By default the DYMO Web Service does not need any configuration. If you change these settings WooCommerce DYMO Print could stop working. Clicking the Configure menu item will open a configuration window. This allows you to change the language and listening port. The web service will normally try to use the first available port within the 41951-41960 range. You can override this behavior by checking the Use single port checkbox, which makes the service only try using the specified port only. You cannot specify a port number that does not fall within the specified range. The service will not try using any other port if an error occurs while using this option.